This is article highlights the work of Starting Smart and Strong, one of several community initiatives where the Early Learning Lab co-designs and supports professional development innovation. Getting ready for school entails more than a hearty breakfast and a backpack. In addition to knowing letters and numbers, teachers say that kids’ true school readiness ideally includes social emotional skills as well as executive function and self-regulation skills — the mental processes that enable us to understand and manage emotions, plan, focus attention, remember instructions, and juggle multiple tasks successfully. 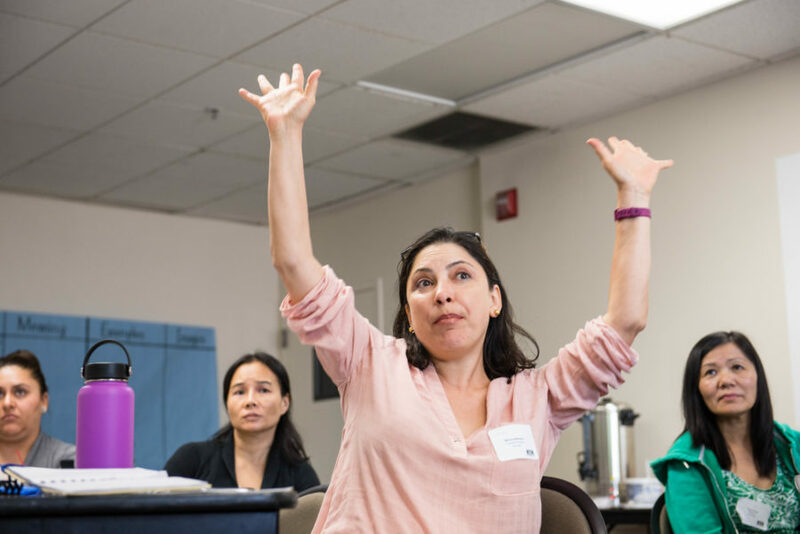 Social emotional learning (SEL) and its relationship to executive function has been the focus of an innovative training at Franklin-McKinley School District in San Jose. Here, early learning educators gather to explore the power of their interactions with children and learn practical strategies that help build empathetic future citizens of the world. Studies find that preschool children are three times as likely to be expelled from school for disruptive or unsafe behaviors as their K–12 counterparts. The high preschool expulsion rate has sparked national conversations and policy statements about building social emotional skills that prevent these behaviors. Like many school districts across the country, Franklin-McKinley School District is seeing challenging behaviors in the classroom. Now, the district’s teachers are working to understand how to prevent and respond to them. The training sessions emphasize the importance of viewing children’s challenging behaviors as a communicative expression of their needs. For example, a child who hits a peer may have wanted to play, not known how to appropriately express feelings, and gotten frustrated. 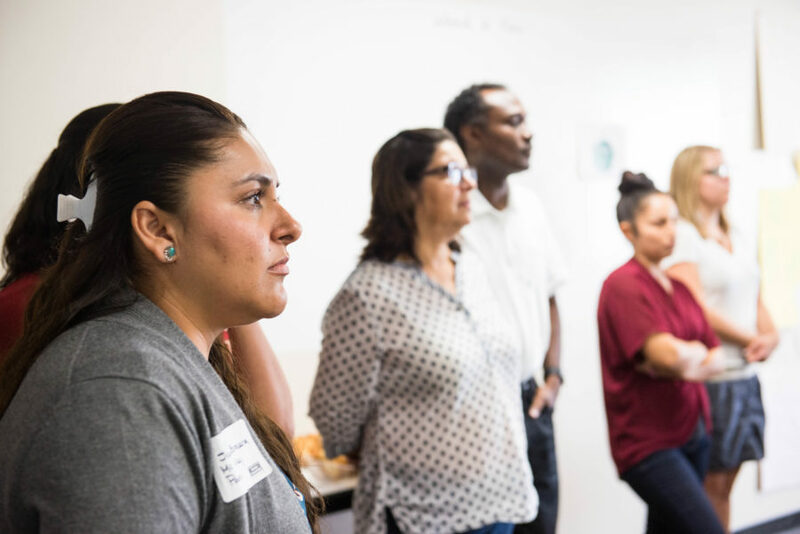 The training — one of several held throughout the year in the district — is part of Starting Smart and Strong, a 10-year initiative funded by the David and Lucile Packard Foundation that partners with three California communities. 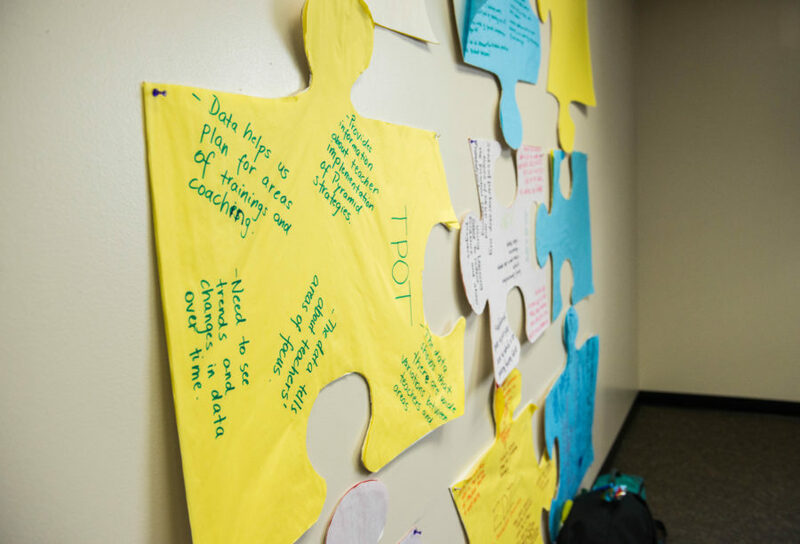 In San Jose, the spotlight is on integrating social emotional learning into the curriculum. The project brings many partners to the table, including the school district preschool and transitional kindergarten classrooms, the Santa Clara County Office of Education, State Preschool classrooms, New Teacher Center, and the Early Learning Lab (Lab). 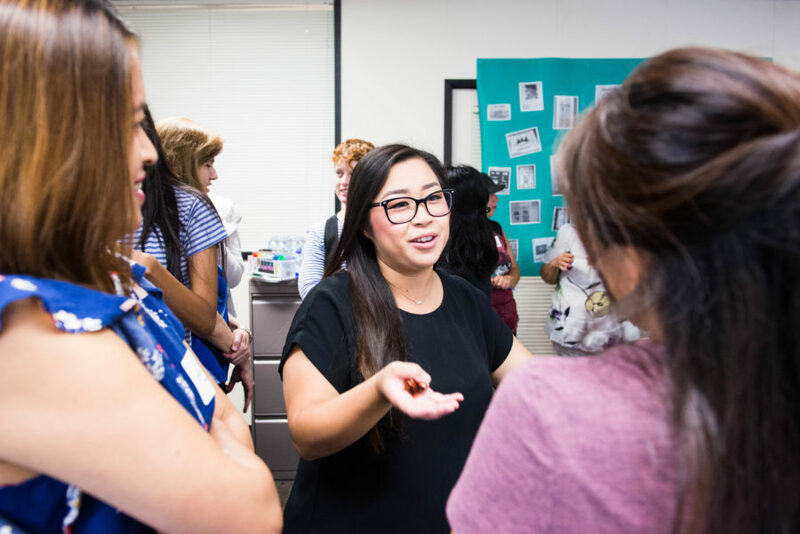 To support the project partners, the Lab worked with them to co-create a professional development model for teachers that meets the district’s needs. This project uses a bottom-up approach, raising teacher voices to the top. During each implementation cycle, the program design changes to reflect the feedback of teachers so they can shape professional development. To ensure the model is useful for the long term, the Lab works with partners to use signature techniques such as co-creating, program design, rapid cycle learning, and reflective practice tools. Together, these provide a powerful foundation to elevate learning and sustain success. The community focused on building upon the Pyramid Model, a framework of evidence-based teacher practices to promote social emotional development and prevent challenging behavior. With the support of the National Pyramid Model Consortium, the Lab and partners adapted the model to align with the district’s curriculum and reflect the latest neuroscience research. Teachers can use the Pyramid Model practices to help children build relationships with peers and adults, solve problems, collaborate in groups, and understand, label, and manage their own feelings as well as better understanding the emotions of others. 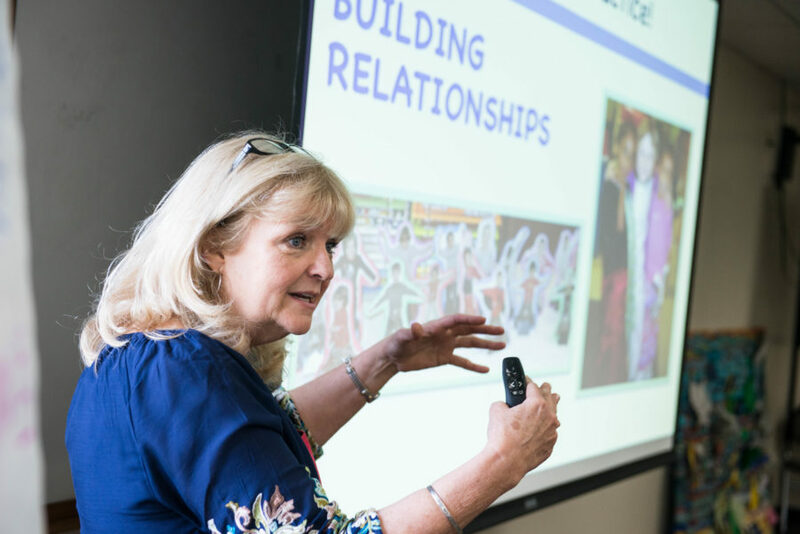 “Many of our teachers were already using some of these practices, but we want them to be even more systematic and intentional about teaching social emotional skills because we know how important this is to a child’s school readiness and future success,” says Dr. Tweety Yates, an expert from the National Pyramid Model Consortium who leads the training sessions in San Jose. Using principles of human-centered design, this professional development model continually evolves and uses responsive strategies that support teachers as they implement the Pyramid Model. With the expertise of Dr. Yates, the project partners adapted the traditional model in response to additional teacher and district teaching priorities that emerged in each year of the implementation cycle. In year one, the project focused on building social development skills and learning the foundations of the Pyramid Model. The following year, the project embedded language and early literacy into social emotional learning strategies. This year, the project incorporates executive function as well as special content area sessions in math, pre-reading, family engagement, and dual language learning, all in alignment with the Pyramid Model. The responsive nature of this project, bolstered by user-driven design and close partnerships with experts, is leading to practical solutions for the district. In one instance, teachers reported that there were too many items on a required developmental assessment tool. They were frustrated that report cards and the tool were separate, creating an overwhelming burden. Subsequently the district aligned the two by using the developmental benchmarks in the assessment tool as the report card, something that other districts are looking into as a result of the success in San Jose. “We are here for you to tell us what works, not for us to tell you what works,” says Chris Sciarrino, director of early childhood practice and innovation at the Early Learning Lab. The project partners create consistency and commonality throughout all professional development activities. In line with Transforming the Workforce for Children Birth Through Age 8: A Unifying Foundation, a report by the Institute of Medicine and National Research Council of the National Academies that provides a blueprint for improving professional learning systems and delivery, each activity builds upon the other. Each professional development activity embeds real-time data and feedback as well as tracks the successes and challenges of using the practices in the Pyramid Model on a daily basis in the classroom. The Teaching Pyramid Observation Tool (TPOT) is one of the professional development tools that allows teachers and staff to see what is working — and what isn’t. The TPOT outlines best practices that support the development of social competence and prevention of challenging behavior. “TPOTing” involves a few hours of classroom observation followed by a 30-minute coaching session so teachers can discuss areas of strength and areas for growth. In addition, teachers receive an average of 180 minutes of high-quality coaching from the New Teacher Center every month. This coaching model takes a strengths-based, data-driven approach to develop teachers’ reflective practice and ability to implement, contextualize, and differentiate the strategies learned in the training sessions to meet their students’ needs. Together, coaches and teachers plan lessons, collect evidence during observations, analyze student learning, reflect on teaching, and more. “The coaching is so valuable because it offers another set of eyes to see the children objectively,” said a teacher. Teachers take a deeper dive into the teaching strategies throughout the year. “We also embed our training content and data tools into the district’s professional learning communities (PLCs) and into the Early Learning and Social Emotional Engagement Project (ELSEE) meetings in an accessible, intentional way so people are focused on learning how to adapt their teaching strategies,” says Chris Sciarrino. Collectively, these professional development activities are designed to work in concert to build the capacity of staff, now and for the future. The project is seeing positive results. For example, in February 2017, one teacher found that only a few children were able to solve social problems without a teacher. By May 2017, all children had this critical social skills. Within the district, there is a growing enthusiasm among educators. More and more, early childhood teachers are using best practices from the Pyramid Model, as evidenced by increasing TPOT results. A group of kindergarten teachers opted into the project and are using and adapting the Pyramid Model practices in their classrooms, creating a seamless transition for children moving from pre-K into kindergarten. After a day of hard work and engagement, the participants were both energized and exhausted. Before they left, the presenters drove home the idea that their teacher involvement was key to the program design and the success of the training. In the current 2017–2018 year, the project continues to grow in scope and reflect the newest cutting-edge research in professional development activities. As the project evolves, key elements of professional development including self-directed learning opportunities, coaching, professional learning communities, and reflective practices will drive quality implementation and maintain the district’s momentum. Most importantly, the project will continue to reflect the voices of the educators who use the teaching practices and support children in the classroom every day. Learn more about our work to improve teacher practice.